The screenshot above is hosted and provided by secure.avangate.com. Please contact them directly for any copyright infringement as we are not responsible for that content. 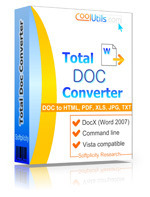 Doc Converter solves the problem of converting DOC files to PDF, HTML, XLS, JPG, TIFF, or Text. RVF format is also supported. The program has been developed to be handy and time saving. Batch mode allows converting as many DOC files as you want. We have also added several options to deal with fonts: now you can define the output font name, font size and font style (bold, underline, italic, strike out). For the perfectly neat output we also added WordWrap option. Use it if you do not want the lines in your document wrap. Transparent interface makes it easy even for a beginner to figure out how it works. Command line is quite helpful for those who want to launch Doc Converter from within other programs.